What is the origin of languages? 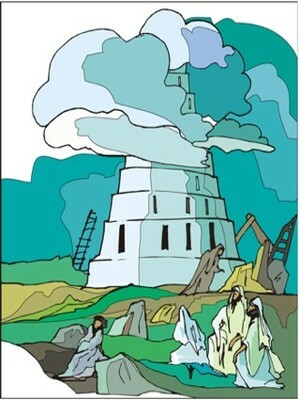 Use the story of the Tower of Babel to explain children just that. You can also refer to this story when exploring one of the essential roles God plays in our lives. 1. After the flood, the people in the land were kind to one another. They all spoke one language. 2. They decided to build a tower that will reach the Heavens so they can be closer to and similar to God. 3. God came down to see the city and the tower which the children of men built. 4. God said: "Behold, they are one people, and they have all one language; and this is what they begin to do; and now nothing will be withheld from them, which they purpose to do." 5. God changed the languages and scattered the people around the earth. On a simple level, this story teaches us how languages were created. You can discuss with the children how in the beginning we all spoke the same language and reinforce brotherhood among all of God's children. On a deeper level, this story teaches us that for proper living on earth to continue, we must respect God. Believing in God means that we believe that there is something larger than us, a higher power. Believing in a higher power means living life in awareness of our actions. God is the ultimate Judge of our actions. God is everywhere and is part of everything. Life on earth will not survive when humans begin to 'play God'. When people do not believe in a higher power they lose the need to explain their actions. Use this story to help your children develop their inner voice, their conscious (God is everywhere, s/he is inside each and everyone of us).